A long while ago, we had studied a shooting sport called "silhouette shooting". A couple of years ago, we studied "clay pigeons", just before the London Olympics. As a theme, we will study sports where shooting plays a part, in the next few posts. Today,we will study the Biathlon, a sport that is played in cold weather and is part of the Winter Olympics. The sport of biathlon is a mixture of cross-country skiing and rifle shooting. It has its origins in military exercises in Scandinavian countries, in the 18th and 19th centuries. Each competitor has to ski through a cross-country course, while carrying a rifle and a small amount of ammunition. At different stages of the course, the competitor has to stop at a shooting range and shoot five shots at targets, at a range of 50 meters (160 feet). There may be two or four shooting ranges throughout the course and half of these are shot at in the prone position and the other half in the standing position. The size of the targets depends on the position used to shoot them: prone position has targets of diameter 4.5 cm. (1.8 inches) and the standing position has targets of 11.5 cm. (4.5 inches). Depending on how many targets are left standing after five shots, extra penalties are given to each competitor. The penalty is in the form of extra time (1 minute per missed target) added to the competitor's time, or extra distance (150 meters (490 feet) per missed target) that the competitor must ski through. The winner is the one with the shortest time through the course. In competitions between 1958 to 1965, high-powered military cartridges such as .30-06 Springfield and 7.62x51 mm. NATO were used, along with military rifles. After 1965, some competitors began to use smaller calibers and lighter rifles, and by 1978, the .22 LR cartridge was adopted as the standard. Separate contests in Norway still use large-caliber military rifles though. These days, modern biathlon rifles are precision instruments, which are crafted to very high standards. A modern Biathlon rifle. Click on the image to enlarge. Image courtesy of Eberlestock. The rifle must weigh at least 3.5 kg. (7.7 lbs.) without ammunition and magazines. It must use .22 LR cartridges and magazines should contain 5 cartridges. Some events allow carrying 3 extra cartridges in the stock, which must be loaded manually, should the competitor miss some shots. The rifle must use bolt action or straight-pull bolt action and no automatic or semi-automatic rifles are allowed. The sights are manual peep sights and no telescopic sights are allowed. 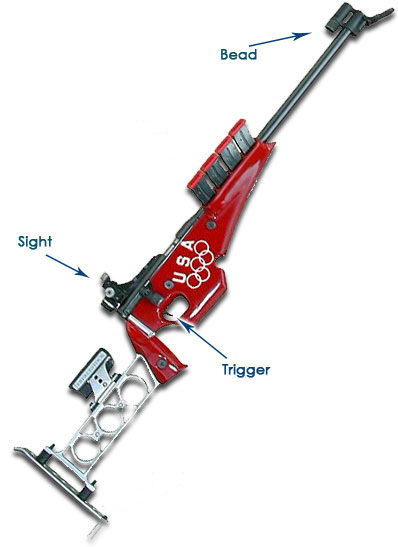 The rifle may have a flip up cap at the muzzle, which can be flipped to prevent snow and rain entering the barrel, while the competitor is skiing. The sling of the rifle may be attached to a cuff on the competitor's arm before shooting, to provide extra stability. The stock is lightweight and very adjustable to each competitor's requirements. Rifles are zeroed before the competition starts, but since it takes place outdoors, the wind and temperature may alter where the rifles shoot, and each competitor needs to adjust the sights accordingly. To make things even more complicated, since there are multiple shooting ranges through the course, a competitor might arrive at one range and find severe wind blowing, but travel to the next range and find no wind blowing there, all in the same course. Each shooting range has flags that flap in the wind, so a competitor can look at these and estimate how hard the wind is blowing and its direction and compensate accordingly. As each missed shot counts as a penalty and adds more time to the competitor's total, it is vital to hit as many targets as possible at each shooting range. This is difficult to do after skiing through a long distance, as each competitor's heart is racing and lungs are pumping due to the exertion of skiing and the cold weather. The racing heart and aching muscles could cause the rifle to shake while aiming at the targets. Therefore, one of the strategies that many competitors use is to slow down as they are entering into each shooting range. This allows them to focus on controlling their breathing and relaxing their muscles a little, before they enter the range. A world-class competitor can enter a range, shoot all 5 targets and then leave in as little as 19-20 seconds or so. There are still contests held in Norway, that use older standards (such as using military caliber cartridges, different distances to various targets, longer distances, carrying a military pack, skiing through trees etc.) These are true to the original purpose of the biathlon, which was to provide military training to people, for the purposes of national defense in times of war. Here's a little video that explains the sport of biathlon for beginners. It appears that the person explaining stuff here is not entirely familiar with firearm terminologies, as she refers to clips instead of magazines and bullets instead of cartridges, but the video does explain the basics pretty well.